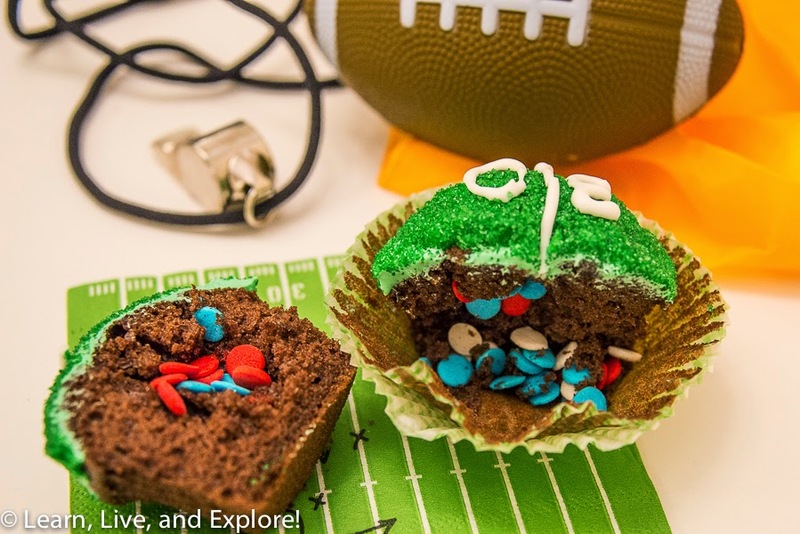 Superbowl Surprise Inside Cupcakes ~ Learn, Live, and Explore! It's Wednesday, and you have three more days to figure out what you're going to feast on with family and friends this Superbowl Sunday! Not surprisingly, I planned my dessert options out first. This year's cupcake is a pretty simple design, but there is a special treat for the feaster on the inside. Much like the currently popular baby gender revealing cake, I have prepared these cupcakes so that they are filled with sprinkles inside of either the colors of the New England Patriots or the Seattle Seahawks! Let's take a step back and talk about the cupcakes first. I'm a big fan of boxed cake mix, which allows me to focus my time on the design. These cupcakes were prepared using chocolate cake mix. The frosting, I could have made my own buttercream, but I went for purchased vanilla frosting then colored it with Americolor "Leaf Green" gel. Before the green tinted frosting was spread on the cooled cupcake, I took a small non-serrated knife and cut out a 1" deep hole in the top of the cupcake. Gently taking out the cake from the hole and setting it aside, I then filled the empty space with sprinkles. Going back to the cake I just pulled out, I cut off the bottom 2/3 of the cake cylinder and replaced the top 1/3 back over the sprinkle-filled hole so that the cupcake dome looked complete once more. Now, I spread the frosting over the top. In a bowl, I poured a generous amount of green decorating sugar, then took the cupcake, turned it upside down, and gently pressed and rolled the top of the frosted cupcake into the sugar ensuring the dome was covered. Don't push too hard, or you will push the frosting around and make a mess of the top. The final step was to pipe on the field lines and yard numbers with untinted frosting that had been slightly thinned out (#3 tip)! Hmm...based on my test cupcake that I cut to show the surprise inside (below), it looks like it may be the Patriots this year. 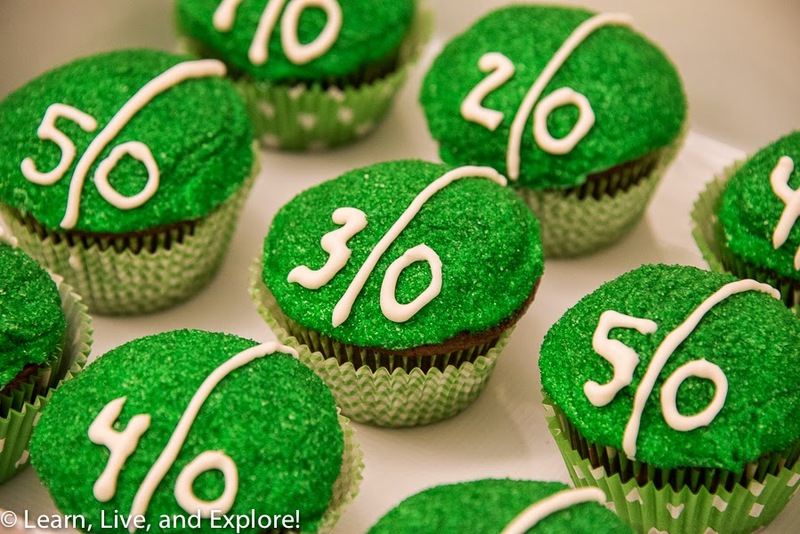 Though, after "deflategate," I'm not sure how I feel about this cupcake prediction. Regardless, try these for your Superbowl buffet and be prepared for a mess when people figure out what's going on after biting into them!